Hmm. The past two days have been pretty neat, just hunting with Peat. Today, near the end of our hunt, my friend Sam punched me in the arm and said, “And you were wanting to get rid of him less than a year ago!” Yesterday Peat pointed 7 coveys, and today he pointed at least 10 times. In each case, he held the birds. And of the 8 birds I killed, he retrieved them all, including a double in which he had to descend 150 feet for the first one, and more than 300 feet for the next one. I’m pretty thrilled with this dog! The recent rains have generated a proliferation of green-up, which – I think – has allowed the hard-to-find supercoveys to split up, which means that it’s easier for the dogs to find birds. Today, it seemed they were everywhere. Peat literally had a field day. Within the first 30 minutes, he’d pointed three coveys and Sam and I each had at least two birds in the bag. Sam, with 65 years of bird hunting experience and a (only slightly) slower pace than mine, suggested something about how I hunted with Peat that was like a revelation: “Peat will hunt as fast as you can,” he said. “Since he holds the birds, let him hunt and go at your own pace so you don’t have to kill yourself to keep up with him.” Sam also remembered me telling him that this season – before Angus got injured – Peat was kind of lagging back and watching Angus, letting the older dog do the work. Peat had been working more like a flushing dog until today; after Sam told me to let him hunt, Peat was working out near 200 yards, covering way more ground than when he was with Angus, who’s never run very big. But Peat would always check back and return on a circular route so he wasn’t just running out-and-backs. In the process, we found birds all day long. 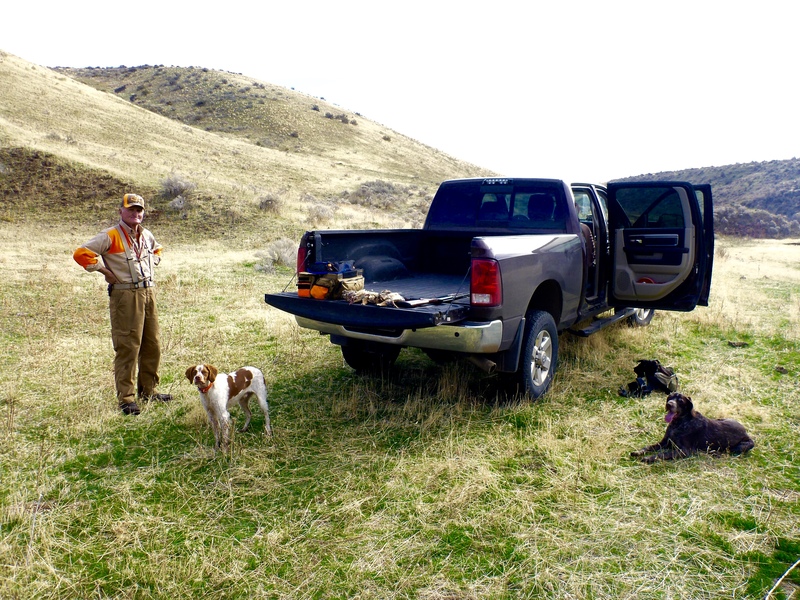 I realize we hit a spot today with a lot of birds, which might be barren in a couple weeks, since that’s how chukar hunting seems to go. They do move, depending on whether Bette Midler’s niece is driving a BMW or Mercedes that week. So you never know. But I’m thinking I’ll keep Peat. For now, anyway. Here are more photos from the past couple of days. I’m happy for you and even more happy for Peat! Never give up on a dog and they will never give up on you! Sounds like a good year. I just spent 4 days in Northern Nevada hunting chuckar on lava ridges. Hit several coveys. I hunt with a Brittany also. My problem is my hunting partner died several years ago and i am hunting solo. That is dangerous at 75 so i am afraid to over extend my self. I just may look at hells cyn next year. 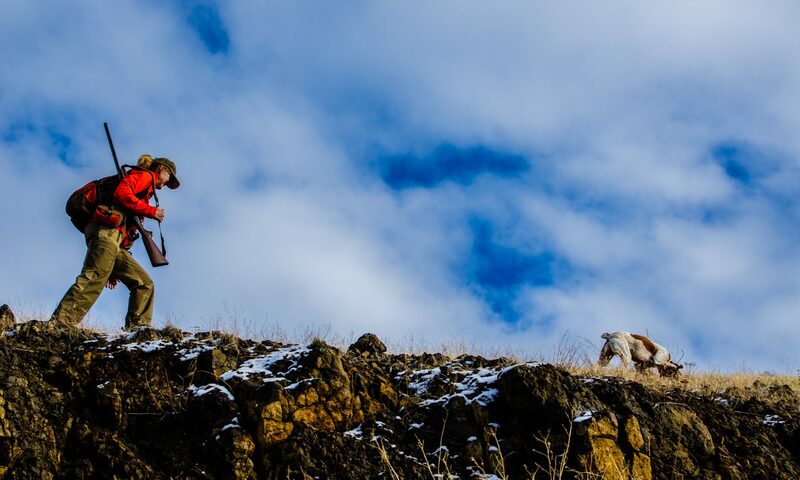 I here you and know what you feel hunting alone in remote areas. I regularly hunt and work in those conditions. Here is my solution: keep your cell phone location service on. It’s found under privacy settings. Next, buy a personal locator beacon such as the acrartex 406link, which will alert rescue efforts to your exact GPS position. Don’t give up. Sure love your posts. Sorry to hear about Angus, but hey! Maybe the silver lining is Peat’s found his stride. I never doubted peat. I’ve hunted with his mom and pops! It’s very satisfying he has acquired the best of both sioux and candy’s in positive ways. Thanks for the this posting. If you ever get tired of Peat you can send him my way I would be glad to have him pair up with my Springer Buddy.